Each 250 mg and 500 mg vial contains dry substance equivalent to 250 mg and 500 mg Ceftriaxone (as sterile Ceftriaxone Sodium BP) respectively accompanied by a solvent ampoule of 2 ml Lidocaine 1% injection USP for IM injection or 5 ml Water for Injection BP for IV injection. Each 1 gm vial contains dry substance equivalent to 1 gm Ceftriaxone (as sterile Ceftriaxone Sodium BP) accompanied by a solvent ampoule of 3.5 ml Lidocaine 1% injection USP for IM injection or 10 ml Water for Injection BP for IV injection. Each 2 gm vial contains dry substance equivalent to 2 gm Ceftriaxone (as sterile Ceftriaxone Sodium BP) accompanied by a solvent ampoule of 20 ml Water for Injection BP for IV injection. 1. Renal and urinary tract infections 2. Lower respiratory tract infections 3. Gonococcal infections 4. Skin, soft tissue, bone and joint infections 5. Bacterial meningitis 6. Serious bacterial infections 7. ENT infections 8. Infections in cancer patients 9. Prevention of postoperative infections 10. Perioperative prophylaxis of infections associated with surgery 11. Typhoid fever. Vertex should not be given to patients with a history of hypersensitivity to cephalosporin antibiotics. It is contraindicated in premature infants and in full-term infants during the first 6 weeks of life. Its safety in human pregnancy has not been established. Therefore, it should not be used in pregnancy unless absolutely indicated. Only minimal amount of Ceftriaxone are excreted in breast milk, so mother receiving Vertex should not breast-feed. Adults: The usual adult daily dose is 1-2 gm once daily (or twice daily in equally divided doses) depending on the type and severity of infection. The daily dose may be increased, but should not exceed 4 gm. For preoperative use (surgical prophylaxis), a single dose of 1 gm administered intravenously 0.5-2 hours before surgery is recommended. In elderly patients, the dosages do not require modification provided that renal and hepatic functions are satisfactory. In patients with impaired renal function, there is no need for dosage to be reduced provided hepatic function is intact. In patients with liver damage, there is no need for dosage to be reduced provided renal function is intact. Gonorrhoea : For the treatment of gonorrhoea (penicillinase producing and non-penicillinase producing strains) a single intramuscular dose of 250 mg is recommended. Children under 12 years: The recommended total daily dose is 50 to 75 mg/kg once daily (or twice daily in equally divided doses). In severe infections, up to 80 mg/kg body-weight daily may be given. The total dose of 100 mg/kg body-weight (not to exceed 4 gm daily) once daily (or twice daily in equally divided doses) is recommended. As soon as the causative organism has been identified and its sensitivity determined, the doses can be reduced accordingly. The usual duration of therapy in meningitis is 7 to 14 days. As a general rule, use the solutions immediately after preparation. Reconstituted solutions retain their physical and chemical stability for 24 hours at or below 25°C (or for 48 hours when refrigerated between 2 to 8°C). The solutions range in color from pale yellow to amber, depending on the concentration and length of storage. The solution color does not indicate the efficacy or tolerability of the medicine. Intramuscular injection: For intramuscular injection, dissolve Ceftriaxone injection 1 gm in 3.5 ml and 500 mg & 250 mg in 2 ml lidocaine hydrochloride solution and inject well within the body of a relatively large muscle. It is recommended not to inject more than 1 gm at one site. Never administer the lidocaine solution intravenously. Intravenous injection: For intravenous injection, dissolve Ceftriaxone injection 250 mg or 500 mg in 5 ml, 1 gm in 10 ml and 2 gm in 20 ml sterile water for injections. The intravenous administration should be given over 2 to 4 minutes. Intravenous infusion: The infusion should be given over at least 30 minutes. For intravenous infusion, dissolve Ceftriaxone injection 2 gm in 40 ml of one of the following calcium-free infusion solutions: sodium chloride 0.9%, sodium chloride 0.45% + dextrose 2.5%, dextrose 5%, dextrose 10%, dextran 6% in dextrose 5%, hydroxyethyl starch 6 to 10%, water for injections. Ceftriaxone solutions may be incompatible with other medicines or diluents and should not be mixed into solutions or diluents containing antibiotics or solutes different to those listed above. Vertex is generally well tolerated. A few side-effects such as diarrhoea, nausea, vomiting, stomatitis, glossitis, rash, pruritus, urticaria, oedema, erythema multiforme eosinophilia, thrombocytopenia, leucopenia, anaemia, neutropenia, elevations of SGOT or SGPT, bilirubinemia, headache, hyperactivity, nervousness, sleep disturbance, confusion, hypertonia and dizziness were reported. Local phlebitis occurs rarely following intravenous administration but can be minimized by slow administration over 2-4 minutes. The stated dosage should not be exceeded. In severe renal impairment accompanied by hepatic insufficiency, dosage reduction is required. No drug interactions have been observed with diuretics or with aminoglycosides. Vertex is supplied as sterile crystalline powder in glass vials. Vertex 250 mg IV/IM Injection: Pack of 1 vial containing 250 mg Ceftriaxone (as sterile Ceftriaxone Sodium BP) accompanied by one ampoule of 2 ml Lidocaine 1% injection USP for IM injection and 5 ml Water for Injection BP for IV injection. Vertex 500 mg IV/IM Injection: Pack of 1 vial containing 500 mg Ceftriaxone (as sterile Ceftriaxone Sodium BP) accompanied by one ampoule of 2 ml Lidocaine 1% injection USP for IM injection and 5 ml Water for Injection BP for IV injection. 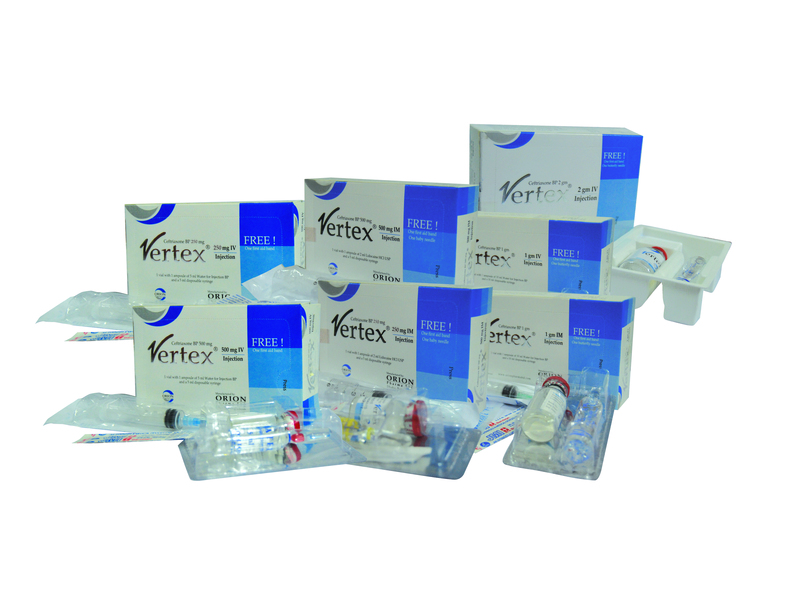 Vertex 1 gm IV/IM Injection: Pack of 1 vial containing 1 gm Ceftriaxone (as sterile Ceftriaxone Sodium BP) accompanied by one ampoule of 3.5 ml Lidocaine 1% injection USP for IM injection and 10 ml Water for Injection BP for IV injection. Vertex 2 gm IV Injection: Pack of 1 vial containing 2 gm Ceftriaxone (as sterile Ceftriaxone Sodium BP) accompanied by one ampoule of 20 ml Water for Injection BP.